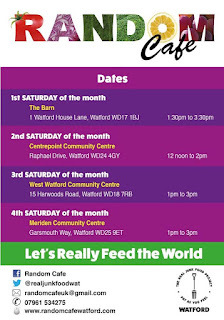 It seems only 5 minutes ago that I caught up with Jane Johnson the 'huge energy' behind the Random Cafe initiative that is making a real difference in the Watford area. The Random Cafe launched only back in September 16th but progress has been nothing short of amazing. Over 1 ton of food has already been saved from the bins and reintroduced back into the community. Jane is quick to add that this has been a team effort and she is immensely grateful to a rock solid core team that has formed around the project that has enabled the remarkable success so far. 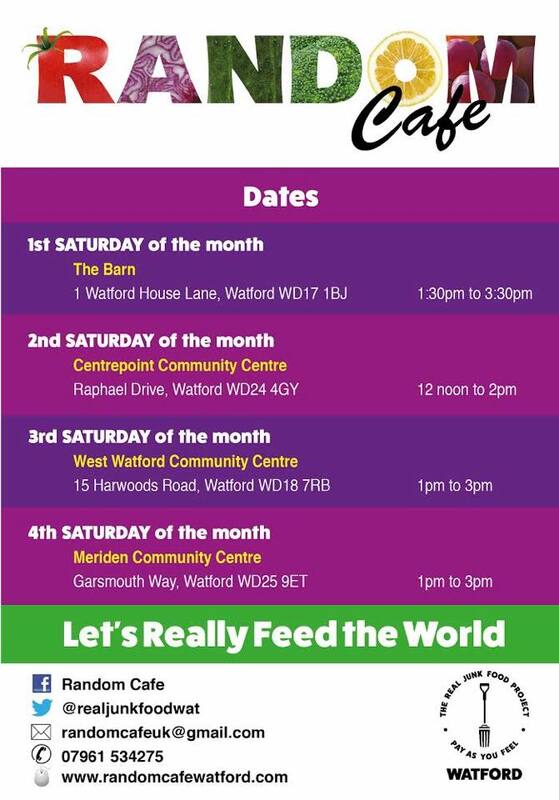 The events for 2018 have already been published as you can see to the right... 4 venues now up and running each month in different parts of Watford enabling a wider range of people to join in and be part of the project. Built on a really supportive network of people created through the Reason coffee and book shop, and the legacy from the fabulous work and ideas of Neal Emery. These people form a real core of supporters who attend, participate and promote the Random Cafe... plus provide regular, valuable financial contributions each week. On average 35+ people visit the cafe each week it runs. The desire to create a community space that brings together different community groups and provide a real contribution to community life. This is already happening with groups wanting to assemble on days the Random Cafe is open... but the potential when a permanent full time venue becomes available is immense. The ability to provide for those that are in real need in these difficult times we live in. Food banks, homelessness and people in dire financial straights has unfortunately become common place and initiatives like the Random Cafe are making a real difference to people's lives.